Mental illness is a common topic of discussion in recent years. Yet, many mentally ill people are still choosing not to discuss their mental issues openly with even their closest families and loved ones. This a widespread secrets hidden within everyday Americans. The stigma that follows mental illness seems to be difficult to crack, but it should not be ignored. For elderly people, mental health issues are especially having an effect on the majority of them. Despite impacting many seniors, mental health is also one of the most untreated and unrecognized categories among them compared to other physical illnesses. Therefore, it is important for loved ones and Elder Caregivers to learn and recognize the different symptoms displayed in seniors behaviors in order to provide the help seniors need to improve their mental health. Although changes do occur naturally as part of the aging process, keep an eye out on loved ones for symptoms of mental illness before it affects them further. What illness do most people associate with seniors when it comes to elderly mental health? Alzheimer’s disease and dementia two top answers, but depression and other mood disorders are mental illnesses that are often being overlooked when it comes to seniors health. Older adults are at an increased risk in depression according to the Centers for Disease Control and Prevention studies, but what makes seniors more susceptible to depression? There are several factors that can attribute to this increased risk. Approximately 8 in 10 seniors experience some kind of chronic health conditions. In addition, nearly half of the seniors are dealing with multiple health conditions. With chronic pains and aches, not only does it take a toll on their bodies physically, but it can equally be a challenge on the seniors mentally. 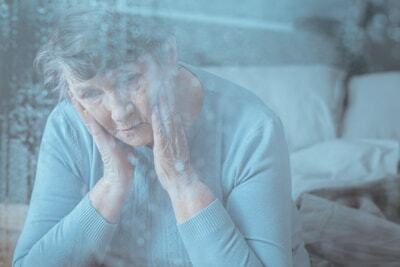 Another common risk factor for depression in seniors is isolation and loneliness. The U.S. Census has reported that over 1 in 4 seniors age 65 and older are living alone. It’s a difficult situation to deal with. On one hand, seniors want to let their adult children spend their time with their own young family. Conversely, it means they’re spending less and less time with with the seniors. In addition, the older you get, the more likely to experience death of friends and families, which also decrease the chances for social contact for seniors. Seniors do not have to settle for social isolation because their friends and families are spending less time with them. It may take a bit of effort and initiative, but growing their social circle is definitely possible even if you’re over a certain age. At the end of the day, age is just a number, isn’t it? Keep up with your faith – If the senior is religious, make an effort to attend a place of worship regularly. It’s a great way to meet new like minded people. Staying healthy – Making friends while exercising is an easyway to socialize. Find a health club in your community, many seniors are using this as a vehicle to make new friends. Learn something new – It is never too old to learn. Many colleges offer free or low cost classes for senior citizens. Keep the mind active and being surrounded by the youthful energy of a university is great. Chronic health conditions can hinder one’s ability to go out and socialize, by providing an in home caregiver, seniors can find Companion Services. These caregiver for senior have the experience to improve with their quality of life while combating social isolation. At A-1 Home Care, we proudly serve seniors in the Los Angeles and Orange County since 1991. As the preeminent Home Health Agency, our in-home care solutions include mobility assistance, meal preparation, and services that aid those with mental illness such as Alzheimer’s, dementia, and depression. Don’t let mental illness affect your loved ones, find affordable home care today with A-1 Home Care. We’re bonded, insured, and approved by long-term care insurance companies. If you live in Pasadena, Sierra Madre, Altadena, La Canada, Glendale, Burbank, and other neighboring cities, please don’t hesitate and call us at (562) 929-8400 or (626)287-0250 today for a free at home assessment!